When it comes to debilitating headaches, migraines often get top billing. But cluster headaches can be even more painful, just as tough to manage, and equally as disruptive to everyday life. Often concentrated in one area—like around the eye—cluster headaches tend to come on swift and strong. They're known to wake people in the middle of the night with brutal pain. They tend to come in fits and starts, with 'cluster periods' lasting anywhere from days to months and then the pain recedes. Time between these cluster periods can be years, though it's common to have one cluster period annually, around the same time of year. While the cluster headaches are relatively rare (affecting 1 out of every 1,000-2,000 people) and their cause not well understood, a new device promises pain relief for sufferers. 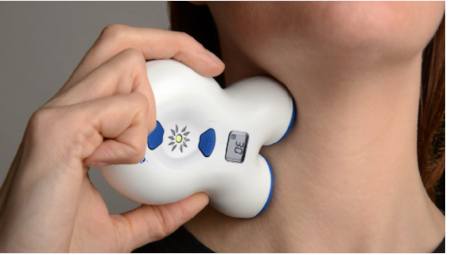 gammaCore is a small, handheld device that stimulates the vagus nerve in order to block nerve activity that makes these headaches so painful. gammaCore claims relief for patients within 15 minutes of using the device, and it can be used up to 8 times a day. There are no drugs involved and any potential side effects are minimal, mild, and quick to dissipate. While the precise cause of cluster headaches isn't known, gammaCore explains that the "vagus nerve—the longest nerve of the head—has been called the “great wandering protector.” It extends throughout much of your body and serves as a control center to regulate many body systems. The vagus nerve plays a role in regulating pain, inflammation, and mood." By tapping into this important pain control center, gammaCore has found some relief for cluster headaches until a cure can be found. While patients wait for prevention and a cure, this treatment sure seems like a good placeholder to me.